CMMI Consultants from DQSITC are not allowed to carry out CMMI Assessment or ISO 9001 or similar assessments which are controlled by ISO 17021 and SEI Conflict of Interest Policy. On the other hand, DQS Certification India’s CMMI Assessors and Management System Auditors (like for ISO 9001, 14001) are not allowed to carry out CMMI Consulting. Conflict of Interest Management and Impartiality Policy. The top layer in the CMMI toolkit consists of Processes which facilitate the implementation of CMMI Process areas. In this CMMI Toolkit the processes are compatible with CMMI Process areas of the CMMI Model Version 1.3 down to the granular level of sub-practices. The second layer of CMMI toolkit consists of Guidelines that complement the processes and provide sub-practice level methodology according to the best practices. The third layer of CMMI Toolkit consists of Checklists and Templates which provide a framework for creating an implementation framework as and when CMMI processes are executed. These are actually the Typical Work-Products as identified in the CMMI Model Version 1.3 . For e.g. for Project Planning Process Area, if the Project Management process is executed then the Project Management Plan Template will capture the evidence of the project-planning details. CMMI Toolkit consists of all such templates, which are required by the each of the process areas of the CMMI and as per Organizational Process Requirements which are based on CMMI Process areas. 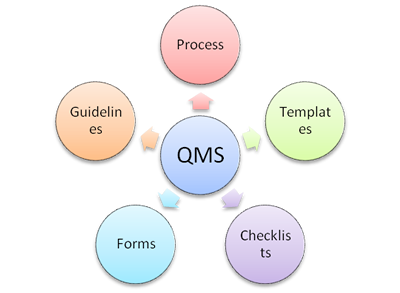 QMS Module is a collection of Processes, Guidelines, Checklists, and Templates, which are arranged in a multi-layered hierarchy and easily accessible by a click on the Browser. 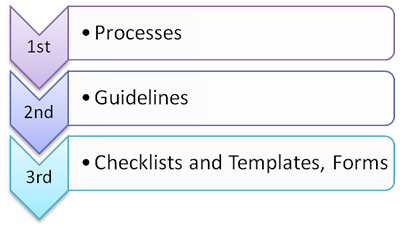 In the QMS Module, the Processes, Guidelines, Checklists, and Templates are very user-friendly. User-friendliness brings Acceptability. Acceptability brings change in Software Engineering Culture. And this is the ultimate objective of an Organization aiming for a Maturity Level. The top layer in the QMS Module consists of Processes which facilitate the implementation of CMMI Process areas. In this CMMI Toolkit the processes are compatible with CMMI Process areas of the CMMI Model Version 1.3 down to the granular level of sub-practices. The third layer of CMMI Toolkit consists of Checklists and Templates which provide a framework for creating an implementation framework as and when CMMI processes are executed. These are actually the Typical Work-Products as identified in the CMMI Model Version 1.3. Note: The actual number of artifacts may differ slightly depending on the continuous improvement to QMS. CMMI Process Model is great collection of best practices. CMMI Process Model proposes the organizational excellence framework.CMMI Process Model enhances our expectations for application development and product quality and service quality. CMMI Process Model enhances customer-expectations as well. The million dollar question is – Can understanding the CMMI Process Model alone is sufficient for developing reliable product and delivery high service quality. The answer is obviously NO. The theoretical concepts of CMMI Process Model have to be translated to workable procedures, guidelines, checklists and templates. These are here for you available in CMMI Toolkit in a very refined form. And that is Why the CMMI Toolkit. Covers processes, templates, checklists and guidelines for most activities performed by IT organizations. Cost effective. Instead of re-creating the wheel again to develop CMMI Compliant Processes, use CMMI Toolkit and save effort and money. Improve chances of success in Formal Assessments. A lot of investment in terms of effort and money has been invested into the preparation of this extensive CMMI Toolkit so that you do not have to invest that much of amount and effort in preparation of CMMI Toolkit. CMMI Toolkit is provided after the customisation to each client. These customisation include formatting of templates, toolkit and then support (remote) for the Installation. You can use the following form to contact us for CMMI Toolkit. Disclaimer: The CMMI Consulting services are provided by a separate legal entity (DQSITC) in order to have full compliance to ISO 17021 and SEI Conflict of Interest Policy. The separate legal entity (DQSITC) does not provide CMMI Assessment Services and will only provide CMMI Consulting Services.